The insane world of Japanese game shows has a new addition, and it involves a person in a Plexiglas cube being pushed around by a bear. Obviously. The video is reportedly from a show called Sekai No Hate Made ItteQ! (Riddles at the Ends of the Earth! ), a prime time TV programme in Japan where people take part in ridiculous stunts. The game itself is believed to be called Predator Shield, and the aim, I guess, is to last as long as you can in the cube before the bear manages to open it up and maul you. Why? Who knows, these shows rarely make any sense unless you’re Japanese, and even then maybe not. 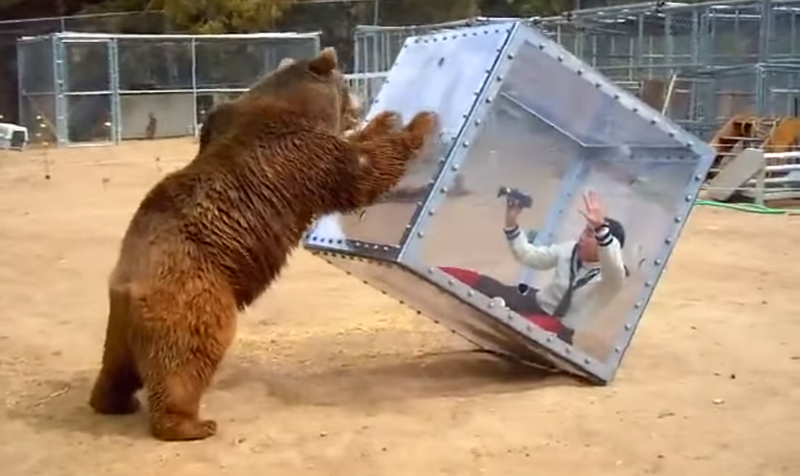 The woman appears to be filming her ordeal with a camcorder from within the cube, as the bear attempts to smash it open. I’m just waiting for the day they introduce challenges like this to game shows over here. Who wouldn’t want to watch Noel Edmonds being chased around the set of Deal or No Deal by an irate grizzly?